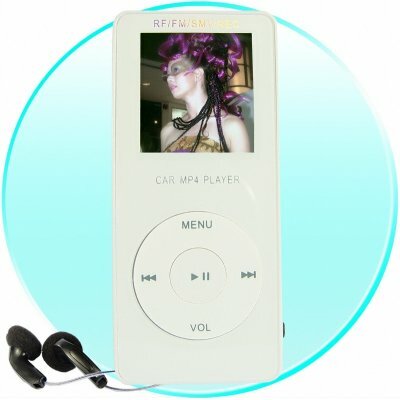 Successfully Added MP4 Player 2GB with FM Transmitter, 1.5-inch Display to your Shopping Cart. Cool multifunction car MP3 / MP4 Player: features wireless RF transmission so you can listen to the music on your car stereo simply by tuning into the signal on your car radio. (This function is available in Car MP3 Adapters / Modulators, but this is an innovation to incorporate the FM transmitter into such a tiny lightweight MP4 video player.) A surefire hot selling gadget. Colours available- black; white: Please specify the colour(s) you require using the comments box in the online checkout process.. Accessories: Free car cigarette lighter power adapter; USB cable; USB wall socket charger in correct format for your country; earphones; and software / user guide. Available in Black or White - please specify your colour choices in the comments box in the online checkout process.